Morning: Start at Fort Pulaski in Savannah, where you can see the Cockspur Island Lighthouse marking the south channel of the Savannah River. While open to the public, access to the lighthouse is limited due to the islet on which the light sits being covered with water during high tide. Take the overlook trail for the best chance to get a closer look at the lighthouse. After your view of the Cockspur Island Lighthouse, make your way two miles east to the Tybee Island Light, one of America's most intact light stations, with all its historic support structures still on site. Explore centuries of history in the lighthouse museum, then hike the 178 steps to the top of lighthouse for a view of the Savannah River and its surrounds. Afternoon: Have lunch at one of the many fine restaurants in Savannah, or save your appetite for fresh seafood at B&Js or Skipper’s Fish House in Darien. From Darien, take the 30-minute ferry ride to Sapelo Island and its 65-foot lighthouse with whale-oil lantern. This landmark, red-and-white striped lighthouse is privately owned and operated, but guided tours of the lighthouse and surrounding island are open to the public and can be reserved through Georgia State Parks. Late Afternoon: Once you arrive back on the mainland, travel 30 minutes south on U.S. Highway 17 to the barrier island of St. Simons and its 104-foot lighthouse. 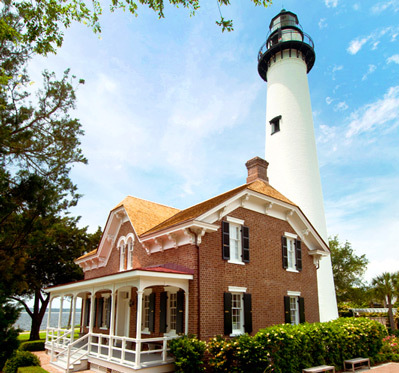 Now under the direction of the Coastal Georgia Historical Society, the property is home to a lighthouse museum inside the former keeper’s dwellings, and guests are welcome to climb the 129 steps to the top of the lighthouse. After dark, make sure to get photos, as the third-order Fresnel lens is still in operation. About 45 minutes south of St. Simons Island, the Little Cumberland Island Lighthouse, located on the northern tip of Little Cumberland Island in St. Andrew Sound, is owned and preserved by a private foundation. Access to Little Cumberland Island is not permitted. Today, a large dune protects the lighthouse from the sea but also prevents good views of the light from the nearest public viewing area – the water.